NBA All-Star Weekend has come and gone but there are still plenty of questions that remain unanswered concerning some of the biggest names and the best teams that the league has had to offer during the 2018-19 campaign. Can LeBron James help lead the Lakers to the postseason with a strong finish to the regular season? Which of the primary contenders in the Eastern Conference stand the best chance of knocking off the Golden State Warriors in the NBA Finals? Also, which surprise contender from the first half of the year is the most likely to fall off down the stretch as the stakes are raised in a significant way? Below we'll try to answer these questions in our latest 3-Man Weave. Who among the surprise contenders will most likely come down to earth in the second half? Brad Botkin: Contender is a fairly loose term. If we're talking about title contenders, there aren't many, and the ones that deserve to be in that conversation and will likely stay there barring something unforeseen. The Nuggets, who I don't believe are a contender but have nonetheless surprised just about everyone, are a candidate to fall with a post-All-Star schedule that Denver coach Mike Malone described to me as "hell" earlier this season. I believe in OKC. I think they stay in the top four. The only other real surprise that you could even halfway call a "contender" for at least a conference finals berth is the Indiana, who I suppose would be my choice here. People expected the Pacers to fall off a cliff after they lost Victor Oladipo for the season, but after losing four straight as they adjusted to life without their star, they went on to win six of seven heading into the All-Star break and currently occupy the No. 3 seed in the East. But look at who those wins came against: The Heat, the Pelicans without Anthony Davis and Nikola Mirotic (when he was still with them), the clearly rattled Lakers on the heels of the trade deadline, the Clippers, the Cavs and the Hornets. Only one of those teams, the Clippers, is above .500. So it's a bit of fool's gold. I wouldn't bet the house that Indiana falls out of a top-four seed. I still think they're a disciplined, steady team that can win regular season games without Oladipo, even if they're doomed in the playoffs. But yeah, they're certainly a candidate to fall off. James Herbert: The Denver Nuggets' defense has gotten worse every month, and they've surrendered 112.4 points per 100 possessions since the start of the calendar year, which ranks 23rd in the NBA. With Isaiah Thomas in the rotation and a brutal schedule ahead, this will be a tough problem to solve. Even with an offense as great as the Nuggets', it will be difficult to hang onto the second spot in the Western Conference, especially if they continue to be mediocre on the road -- not only do they have a 14-14 record in road games, they have a minus-2.1 net rating in those games. It is worth noting that Denver has beaten the third-seeded Oklahoma City Thunder twice this season, and they'll meet twice more. I hesitate to say those games will feel like playoff games, but they could be significant in terms of seeding. Jack Maloney: If we're talking surprise contenders that really includes just the Bucks and Nuggets, in my opinion. All of the other teams -- Warriors, Thunder, Raptors, Sixers and Celtics -- at the top of their respective conferences were expected to be there. And to be fair, the Bucks and Nuggets weren't supposed to be bad, but they're definitely exceeding expectations. Out of those two then, I'd take the Nuggets as the more likely to come back down to earth. The Bucks are a machine. They've got the best defense in the league, the best net rating, the best record and they play in a much easier conference. 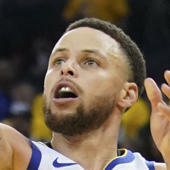 As for the Nuggets, their defense has slipped since a strong start early in the season -- though they still come in at 13th in the league in defensive rating overall, they've given up 112.4 points per 100 possessions since the calendar flipped to 2019, which is 23rd in the league in that span -- and they have a tough schedule ahead as Brad noted. If either of these two teams are going to have a rough second half, I'd bet on it being the Nuggets. Will LeBron and the Lakers find a way to make the playoffs? Botkin: I'm going to say yes with the confidence of a teenager with a stutter. I mean, it's LeBron James. Lonzo Ball is due back when the Lakers come out of the All-Star break, and he makes a bigger difference than you think -- the Lakers were a top-seven defense with him and fell to 29th over the month he was out. Given his limited offensive role on this team, Ball's most valuable attribute right now is his defense. Adding Reggie Bullock will help space the floor for LeBron, who is going to go into takeover mode. Still, this is going to be a photo finish. The Lakers have one of the 10 toughest remaining schedules with 13 of their final 25 games on the road. They have to go 22-3 to close the season to finish with 50 wins, and you can forget that. Just to get to 47 wins, which feels like the bare minimum to even have a shot at a playoff spot, they have to go 19-6. They still have to play the Bucks twice, the Jazz twice, the Rockets, the Warriors, the Celtics, the Raptors, the Thunder, the Blazers and the Clippers in the final week of the season, which could end up being an effective play-in game with the Clippers currently owning the No. 8 seed. As I said, I think the Lakers will squeak in on the LeBron factor. But I have pretty much zero confidence in saying that. Herbert: I lean toward them making it, but they can't mess around. They had a top-10 defense before James' groin injury, and I like what Reggie Bullock and Mike Muscala can do for their offense. They'll need to make real progress on both ends extremely quickly, though, if they're going to make the kind of run that would vault them past the Kings and Clippers. And if they're going to avoid the Warriors in the first round, they'll need to leapfrog another team, too. I'm just not sure how to account for all the tension around the team leftover from the Anthony Davis brouhaha. There was obviously a disturbance in Los Angeles, but we have seen James carry his team during times of deep dysfunction before. It's time for him to do it again. Maloney: Oh man. I know this is kind of a cop-out, but I'm going to hedge here and say it depends on how they look in the first few games out of the break because I think it could go either way. All of the Anthony Davis trade rumors, which enveloped pretty much the entire roster besides LeBron James clearly had a negative effect on the team. They were embarrassed by the Pacers ahead of the deadline and lost to the Hawks in their last game before the break. Entering the second half of the season, I think we'll know pretty much right away how the rest of their season will go. If it's clear some time away from everything gave them a chance to re-set and lock-in for the stretch run, they have a strong chance to get in with LeBron leading the way. But it's definitely possible that all the drama from the A.D. situation did too much damage to smooth over in time, and they'll continue to fall apart. Right now they're three games back of the eighth seed with 25 games to play, which is enough time to make a run but doesn't leave much room for error. If I had to lean one way, I'd say they won't get in, but I'm not super confident betting against LeBron. Which East team is best equipped to face the Warriors in the Finals? Botkin: I've felt all along it's the Celtics. Even the Warriors have repeatedly said this. Kyrie Irving has proven he can take it to Golden State on the biggest stage. The Celtics have a super versatile defense that in theory can switch everything the way Houston did against the Warriors last year. They have multiple playmakers and awesome depth, which is huge against the Warriors, who are not as deep as they have been in championship years last. Boston, in my mind, is still the best team in the East at their peak. Now, whether they'll find their peak is another question. And even if they do, it's not as if the Bucks, Raptors and/or Sixers couldn't beat the Celtics, even at their best. Anyone who tells you they can definitely identify the best team in the East is a liar. Those top four teams are virtually inseparable. Every scout I've talked to about this has basically thrown his hands in the air. Nobody knows who's coming out of the East. So while we can sit here and talk about who can potentially threaten the Warriors -- which again, from a matchup standpoint, in my opinion, is the Celtics -- the only question that matters is how those four match up with each other. Because only when that question is answered can anyone in the East even start thinking about anyone in the West. Herbert: I'd rather answer this in April or May, as Milwaukee is the only Eastern Conference contender that doesn't feel like a work in progress. If forced to choose now, though, I'd say Toronto, based on its upside. The Raptors can throw Kawhi Leonard at Kevin Durant, and they're smart and versatile enough to (theoretically) take the Warriors' out of their offense. If they're knocking down their outside shots, then they can push Golden State on the other end, too. That said, if the Warriors are healthy and clicking, I'd applaud any of these teams for merely taking a game or two. Golden State should still be seen as heavy, heavy favorites. Maloney: Agree with Brad here that it's the Celtics. They haven't had the season everyone expected, and they might not even get out of the East, because the last two rounds there are going to be bonkers. But if they do, I think they have the best chance of knocking off the Warriors. As has been proven time and again, you need a great one-on-one scorer in the playoffs who can get you buckets when everything breaks down, and the Celtics have him in Kyrie Irving. Plus, Irving has been in championship situations before, hitting the game-winning shot in Game 7 of the 2016 Finals to beat the Warriors. Then, perhaps most importantly, they have an elite defense with a number of versatile wing defenders who can switch and guard multiple positions. The Warriors are still probably going to score no matter who's guarding them, but the Celtics can make it more difficult for them than just about anyone. Plus, if you just ask the Warriors themselves, as The Athletic did a few weeks ago, they'll tell you that the Celtics are their biggest threat.